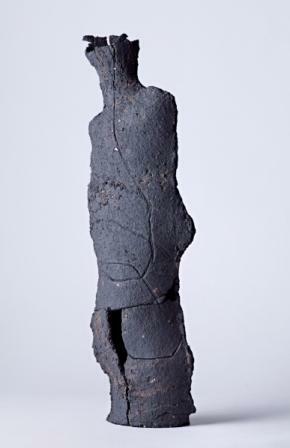 Sarah’s work has a primitive quality about it, slab-built from coarse black clay; the forms are torn, textured, rough-edged and purposely imperfect. Often left unglazed or spontaneously bronzed to enhance the rawness of the surfaces. Glazes when used are freely poured, splashed and slip-trailed; rips and tears become an essential part of the making process, revealing the life of the form and the journey it has been on in its creation.